Pursuing your passion while helping the environment and the community is an inspirational journey and one that I love to share in the hopes to inspire others to do the same. Beau Lake has partnered with the One Drop Foundation to do just that with their Special Edition One Drop Paddleboard. Their partnership is a testament to what Casper & Casper is all about: environmental initiatives that create a better planet, using innovative, eco-conscious design and manufacturing choices to bring new ways of enjoying what you love, while at the same time helping society as a whole. Canada-based company Beau Lake is the manufacturer and designer of the impressive paddleboards, infusing luxury into your waterside experiences. The pride of co-founders Paul Lavoie and Lee Kline, they clearly use nature as part of their design inspiration. Each and every board in the collection is meticulously hand-crafted from materials that they name their boards after. They also use performance materials such as fiberglass and epoxy resins, and a UV-protected topcoat to create sleek and contemporary finishes. 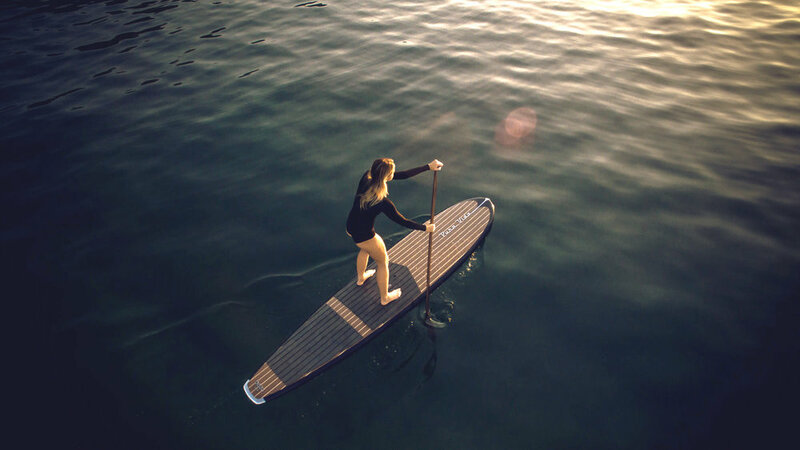 The length, shape and make of their boards appeal to waterside hobbyists and dedicated paddleboarders alike, all without sacrificing the beauty of water that the product aims to capture in its design sensibilities. Some, like The Muskoka 11’6”, evoke an air of summer lake relaxation, while the eye-catching Rapid 14’ is designed for those aiming for quality performance for their weekend racing sessions. They also offer paddles and rash guards if you want to experience the real rush of paddle-boarding, The Great Lakes Chair to keep you in your element as you settle back ashore, the versatile and easy-to-use Malibu 8’ Surf, and an eco-conscious Runabout Pedal Boat that is built for excursions, sunset cruises and lake explorations. Beau Lake does not just ride the waves – they create them. Water is a necessity, but not all people have access to it, and that’s when One Drop makes all the difference. The One Drop Foundation, founded by Guy Laliberté – yes, that Guy Laliberté, founder of Cirque de Soleil – believes in the long-term impact and sustainability of giving others access to one of the most important elements of living. Their unique Social Art for Behavior Change approach “aims at engaging communities in taking ownership and embracing adequate behaviors towards water, sanitation and hygiene”. This is where Beau Lake fits into the proverbial puzzle. Their appreciation is not just for the call of the water, but also for the importance of our role in the community to make this necessity available for everyone else in the long-term. Being eco-conscious and socially-conscious doesn’t have to be mutually exclusive. Luxury products don’t just have to benefit the luxurious. Beau Lake proves that ensuring that people get access to their basic needs isn’t social justice, it’s social responsibility, especially when they’re in a position to do so. The Beau Lake and One Drop partnership draws from their shared element, and the smooth flow between design, ergonomics, eco-consciousness and social responsibility all make for a powerful tide of change that I’m sure will influence the world in more ways than one.